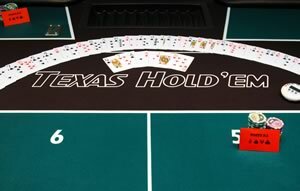 Do you enjoy Texas Hold’em Poker? If you do it’s time to find a casino in Nigeria that can offer you a true gaming experience. Forget about the stresses and strains of the day or week and spend a few hours in a casino relaxing, having fun and potentially winning big. Texas Hold’em Poker is a form of poker that is great for both beginners and experienced gamblers. This type of poker can be quickly picked up on and you can expect to be playing confidently in just a few hours. Blinds and antes are placed out. Dealer shuffles a deck of 52 cards and provides each player with 2 cards face down. These are called “hole cards” or “pocket cards”. Starting with the player to the left of the blind, a round of betting is started. Here is when players call, raise or fold, depending on their hand. The top card of the deck is discarded by the dealer – this is the “burn card”. The flop is then performed where the next 3 cards are flipped over and can be used by any of the players in combination with their 2 pocket cards. The player on the left of the dealer then begins the next betting round. After betting, the dealer repeats the burn process and the flop process by flipping one more card over. This is called “the turn”. The player on the left of the dealer then starts another round of betting which is followed by a repeat of the burn process and one last card being flipped face up. This is called “the river”. When this happens, five cards will be face up on the table. Players can use any of those cards and their 2 pocket cards to form a five card poker hand. One final round of betting is started as before. The showdown is when the players who have not folded must reveal their hands. This process starts with the player to the left of the last player to call. The player who has the best hand wins. The casinos in Nigeria offer the perfect opportunity to try your hand at Texas Hold’em Poker. These casinos welcome all gambling enthusiasts to try their hand and luck at a variety of casino games. The best casinos in the country can be found within Nigeria’s buzzing hotspots, within or in close proximity to esteemed hotels. Whether you are staying at the Sheraton Hotel, Concorde Hotel or Bougainvillea Hotel, or just visiting for an afternoon or evening of entertainment, both the casino and hotel facilities are available for you to enjoy. Have a meal at any of the hotel restaurants or savour the delicious casino buffets. Nigeria’s casino hotels also offer trendy bars and night clubs that gamblers are welcome to visit, so why not try your luck at playing Texas Hold’em Poker and have a wealth of other entertainment opportunities opened up to you too. Contact us for more information on Nigeria’s casino’s games today.